Editor’s note: This post is written by guest blogger Duncan Currie, Legal Advisor to the DSCC. Duncan has practiced international law and environmental law for over 25 years and has advised the DSCC on bottom trawling issues since its inception. It’s not every day that we see a ray of sunshine penetrate the deep blue ocean, but you can put a ring around June 3, 2011. That was the day that the so-called BBNJ, more properly known as the Fourth Meeting of the Ad Hoc Informal Working Group to Study Issues Relating to the Conservation and Sustainable Use of Marine Biological Diversity Beyond Areas of National Jurisdiction (you can see why it needs an acronym) reached an agreement on recommendations. This sounds very UN-speak and vague, but it is actually very significant. BBNJ has for the first time agreed that discussions can go forward on two crucial issues: the possible development of a multilateral agreement under UNCLOS and the sharing of benefits from marine genetic resources. These two issues have been stumbling blocks for the five years that BBNJ has been meeting, and for the first time, agreement has been reached that these are legitimate matters for negotiation. 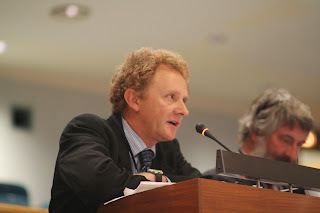 What this means for the high seas is that negotiations on long-overdue reform of oceans governance are in sight to allow networks of marine protected areas in the high seas to be established, to require environmental impact assessments of activities that may harm the marine environment, and to put into place a system which lays out who benefits when products such as pharmaceuticals are developed from marine genetic resources taken from the high seas or deep seabed. Delegates emerged from the fifth day of open debate and intense closed door negotiations with broad smiles of relief after the breakthrough agreement was reached. There’s still a lot of work to be done, but we can allow ourselves to reflect on a ray of hope for the deep seabed and high seas, which is so crucial to life on this planet.